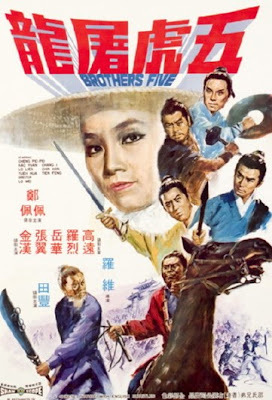 When I set out to rewatch a few Cheng Pei-Pei titles, it's ironic that one of my first choices was 1970's Brothers Five as the female star is not the main focus of the film. Still, this Shaw Brothers film from director Lo Wei is a lot of fun and it has a great cast apart from the lovely Pei-Pei. The film opens with Yueh Hua coming to the aid of a man being beaten by a coach driver on his way to the Flying Dragon Villa, a place spoken of in hushed tones by the onlookers. Yueh Hua fights off the driver and the guy flees leaving the carriage driver-less. Out steps the mysterious Yan Loi (Cheng Pei-Pei), daughter of a martial arts hero and on her way to Flying Dragon Villa herself. She gets Yueh Hua's character to drive her and off they go. Gao Wei (Yueh Hua) fights off some more attackers and then Yan Loi explains her story. As it turns out, Gao Wei was on his way to meet the woman's father. The father is now dead and villain Long Zhen Feng is to blame. Gao Wei is the fourth in a set of five brothers who were raised separately and so on. Basically, there's revenge to be had, you know? Typical wuxia plot set in the martial arts world. That's not to diminish it, just to save me time in typing out all the intricacies that don't matter unless you are watching the film. Cut to blacksmith Gao (Chin Han) who is being bullied by some officials about an order for some swords. In the same town, a typical wuxia inn scene turns into a fight with one of the brothers, Gao Zhi (Chang Yi from 1967's The Silent Swordsman), taking on some toughs. 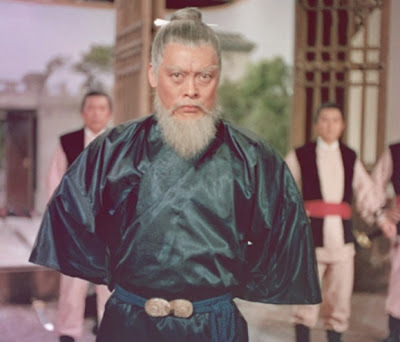 As the swordsman goes up against a representative of the Flying Dragon Villa (Wong Hap), one could be cynical and say this film is not doing anything new. 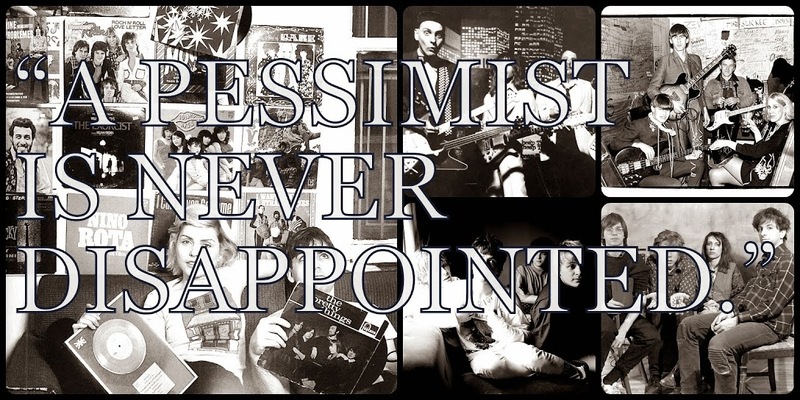 But that's not the point. The action is fast and fun and well-staged and shot. Sometimes that's enough. 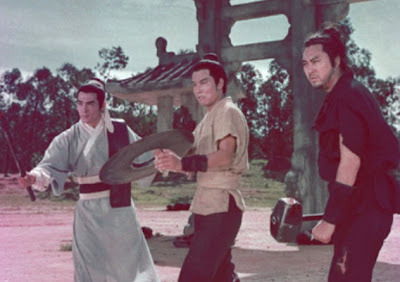 After these scenes, we finally -- a good 30 minutes into the picture -- see the Flying Dragon Villa as Blacksmith Gao (Chin Han) attempts to enter and batters a set of guards with his mallet/hammer. It's a blast of a scene and the real locations add a nice vibe. There's no music, a lot of wide shots, and plenty of action. Yueh Hua's Gao Wei shows up and the battle continues. And then, Chang Yi's Gao Zhi arrives! It's all a bit silly but it's great fun for a viewer. Brothers Five came out at the right time. 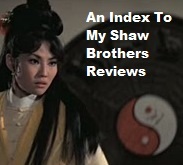 It's not as insufferably heroic and macho as a Chang Cheh film, nor is it as stodgy as a few of the other mid-1960s Shaw wuxia titles. The use of a real outdoor location for the Flying Dragon Villa gate scenes helps immensely as it feels somehow different to watch this carnage -- Blacksmith Gao's hammer swinging, Gao Zhi's short blade parrying -- against a blue sky and green fields. As the three brothers fight on, the old villain of the Dragon clan comes out. Sure enough, as you could guess, it's Tien Feng. As the old master battles the brothers, Cheng Pei-Pei's swordswoman Yan leaps into the fray to beg for mercy for the brothers. 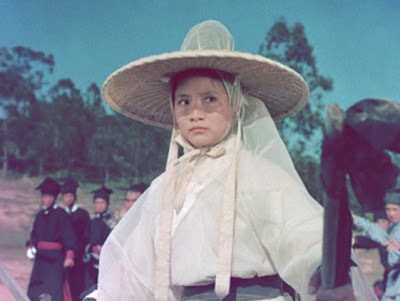 Cheng Pei-Pei leads the three fighters into the woods to rest and recuperate and hide from the Flying Dragon clan. The guys discover they are brothers, bond, and hatch plans for revenge. Conveniently, Cheng Pei-Pei's Yan Loi has a fighting manual that will help the men defeat their enemies so she hands the five tigers with one heart manual off to the guys. Later in the picture, the bad guys have captured another Gao brother, Gao Yong (Kao Yuan), who is trapped and injured on the top of the gate to the Flying Dragon Villa. Lo Lieh rides up with paper granting him entrance to the place. He accepts a challenge to fight the guy off the gate and, instead, climbs up and rescues the guy and rides off. While the two are off recuperating in the woods in a similar scene to the three brothers earlier in the picture, the two discover that they are both Gao brothers: Gao Xia (Lo Lieh) and Gao Yong (Kao Yuan). Somehow those two end up at the same place with the other three, who are training in the courtyard, and soon Cheng Pei-Pei arrives and you can see where this is heading. Can you say bloody revenge? Finally, the five and Cheng Pei-Pei ride to the Flying Dragon Villa gate -- again! -- and this time, the real fighting will begin. Sure, Brothers Five is a bit too long by this point but can you really fault any film with a nearly 15-minute final action scene? You want sword fights -- and a hammer fight -- then you get it here. 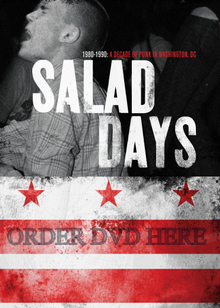 You can order Brothers Five on DVD here.